Ladies and gentlemen of all ages! An incredible AND unforgettable show for the entire family…and deserving of the trademark, America’s living national treasure! This circus is rich in history and definitely worth a read if you are a fan..after numerous failed business ventures, P.T. Barnum turned his sights to the entertainment industry. His first attempt was P.T. Barnum’s Grand Traveling Museum, Menagerie, Caravan & Hippodrome. In 1881 he merged this show with James Bailey and another partner. “The Greatest Show On Earth” was coined in 1882 and the evolution of today’s circus was well on the path to thrilling millions of people with the animals, showmanship, clowns and comedy we know today. 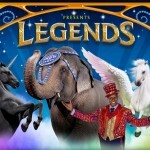 Watch as performers from around the world beckon mythical and mysterious creatures ringside to amaze and thrill!..a unicorn, a pegasus and a woolly mammoth are among the creatures ready to entertain all.